Evolution is often perceived as being a “directional” or “adaptive” process. We often think of species evolving to become stronger or faster, or to have sharper teeth, for example. And we tend to see this as being inherently progressive. But this is not always the case. Sometimes evolution can be regressive, such as when animals lose a trait. A classic example is cave fish or mole rats, which inhabit caves or subterranean niches, and have lost their capacity for sight. Yet, providing a convincing argument for how regressive evolution occurs has remained a philosophical enigma, even before the advent of Darwin and Wallace’s theories of natural selection. The key question is whether the loss of eyes is an adaptive response to a dull existence, or whether cave creatures are simply the victims of a series of unfortunate events, like the accumulation of deleterious genetic mutations in the absence of Darwin’s corrective hand of selection? As it is difficult to imagine that eyes, though useless, could be in any way injurious to animals living in darkness, I attribute their loss wholly to disuse. An alternative perspective is offered by the “neutral theory”. This “non-adaptive” theory predicts that the loss of eyes is due to the absence of selection altogether. Typically, we would expect directional or “purifying” selection to remove random deleterious mutations from an organism’s genome. But if selection is not at work, then these non-advantageous mutations will accrue and continue to be passed on to subsequent generations. Eventually, such mutations are likely to lead to the improper transcription of DNA to RNA. This, in turn, means that some functional proteins may not be produced. The challenge for biologists is to explain the nuts and bolts of how either “adaptive” or “non-adaptive” regressive evolution operates in a mechanistic sense. Recent advances in gene sequencing technology allow us to address this conundrum in the most comprehensive manner yet. I recently led a study that applied these methods to a natural experiment set up by evolution: namely water beetles that have descended into the underground calcrete aquifers of the Western Australian desert. These subterranean beetles have invaded a new niche and are derived from ancestral surface species. 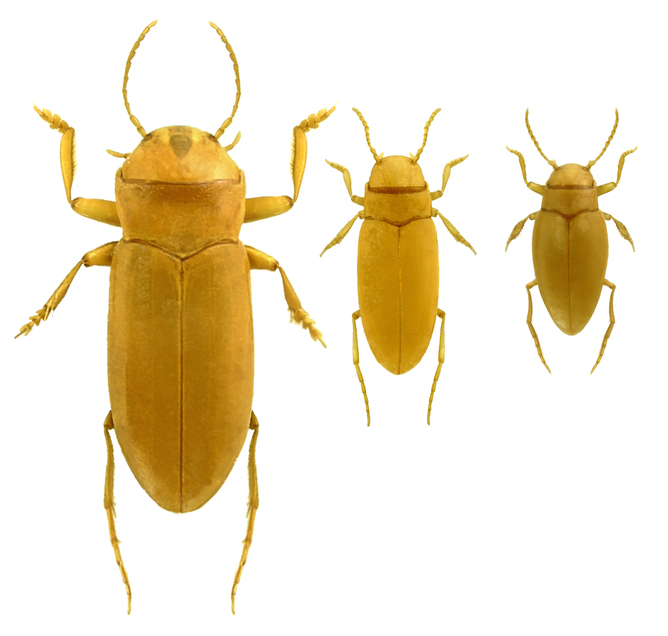 The underground species have made this habitat transition on multiple independent occasions because the geological formation of the calcrete has meant that most of the aquifers containing these beetles remain isolated from each other. Such isolation over extended periods of geological time (i.e. millions of years) has led to several new species emerging, resulting in a diverse spread of the different species across, and beneath, the landscape. Very few scientific studies have explicitly demonstrated the genetic loss of vision, probably because few of the populations that have been found are of sufficient evolutionary age to tease these issues apart. This study of the water beetles thus represents one of the most informative biological systems because there are multiple comparisons enabling robust statistical assessment of evolutionary theory. Our study compared gene expression profiles, called “transcriptomes”, of three subterranean species with two surface relatives. We discovered a gene, “opsin”, which is involved in animal vision, in a species of blind beetles which has been trapped within the aforementioned underground caves for millions of years. These opsin proteins form visual pigments, which turn photons of light into a signal that gets sent to the brain. Thus it was unexpected that they were found at all, given that there is no light to activate the vision signalling pathway. And also because these animals have no eyes. This raises two questions. First, is there some alternate useful function for the opsin gene aside from vision? This is referred to as “pleiotropy”, where a single gene has multiple functions. However, at present, we have no evidence to predict what these other functions may be. Secondly, has there been sufficient time for non-adaptive evolution to render this gene inactive, resulting in the cessation of proper gene transcription? In the remaining two subterranean beetle species investigated in this study, which were found in different caves, we found more preliminary evidence for non-adaptive evolution: these species did not transcribe any opsin genes at all. This discovery seems to support the neutral theory predictions. So, in contrast to our intuition that evolution is always progressive, our study shows this is not necessarily the case. Rather, we are on the verge of documenting non-adaptive evolution at a molecular mechanistic level and across a much wider number of species, thanks to the humble water beetle.